Madge telling Harold that he's got to let go of Kerry and get on with his life. Harold breaking down in Madge's arms. Matt opens the front door to find Harold standing on the step. He invites him in. Harold has returned some books, but he sighs that the reporter wasn‘t the faintest bit interested in Kerry. Matt tells him that that's the reporter's loss. Harold walks across to the shelf in the lounge room and starts looking at some of Kerry's craftwork lovingly. Matt offers him a cup of tea, but he declines. As Matt heads out into the hallway to make a cup for himself, there's a knock on the door. Matt opens it and Mel bursts in! She tells Matt cheerily that she's almost packed and ready to move in tomorrow; she just needs a key. Matt tells her that he only has one; Joe took the other one with him. Melanie suggests that Matt give her that key and she'll get one cut at work tomorrow. MATT: You *will* be here when I get home? MELANIE: Scout's honour! Sure I will be! It's going to be fun sharing again, isn't it?! With that, she heads off again. Matt looks over at Harold, who's holding some of Kerry's handmade multicoloured bracelets. HAROLD (sadly): They are beautiful, aren't they? Bright... vivacious... Just like her. Christina is watching TV. Paul sits down on the couch. Isabella is sitting on the floor, leaning on the coffee table, and she tells Paul that she's writing to her little sister about possums: she has never seen such a thing. PAUL: Didn't you tell her when you called? ISABELLA (looking caught-out): Pardon me? PAUL: Melanie said she saw you using a pay ‘phone the other night to call your family. Isabella, you don't have to use pay ‘phones; you can use the one here whenever you want. ISABELLA: I cannot do that. Paul assures her that what's his is hers. Isabella cries that such ‘phone calls are expensive. Paul, however, insists that he can afford it. Isabella says that she'll perhaps use it tomorrow. CHRISTINA: Keep it short, will you? PAUL (looking aghast): Hey, Chris! CHRISTINA: Caroline and I pay the ‘phone bill here too. As Isabella said, calls to Argentina don't come cheap. ISABELLA: Please, I don't want to cause any trouble. CHRISTINA: I just don't think we should get stuck with it, that's all. PAUL: Listen: I will have the ‘phone bill itemised and any charges that Isabella rings up, I will pay for. Is that OK? Madge and Helen sit down in the lounge room, Madge sighing as she does so that maybe she shouldn't have forced the issue. 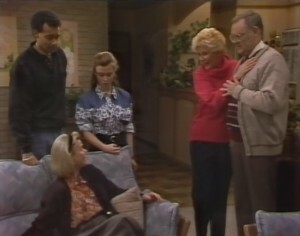 Eddie and Gemma join them as Harold comes in through the front door. Everyone quickly falls into silence. HAROLD: Discussing me, were you? EDDIE (jovially): No, of course not! HAROLD: Don't bother, Eddie: I know I've worried everyone a great deal lately. HELEN: But you've been through a very difficult time, Harold. HAROLD: Yes... and I haven't coped very well. MADGE: We don't expect miracles. HAROLD: Yes, well, everyone seems to think that a change of scene would do me good – and I know I've resisted, but now I think you might be right. Madge leaps up and throws her arms around him, happily. Harold suggests that they go away for the weekend. Madge, however, insists that they need at least a couple of weeks. Harold tells her that the Coffee Shop needs him. Eddie and Gemma insist that they'll help. Helen adds that she can lend a hand when Gemma goes back to school after the holidays. MADGE (to Harold): That's settled: we can go? Melanie is talking on the ‘phone. MELANIE: Yeah, mum, we got everything in... I'd love to, but I've got to wait here for Matt and I've got heaps and heaps of unpacking to do... OK then... Love to dad. Bye. MELANIE: I'll unpack later! First things first: some music. With that, she selects a tape, puts it in the stereo, connects the headphones, sits down in the armchair and puts the headphones to her ears. She then sits back and sighs happily. Gemma and Matt are walking across the street, Gemma saying as they do so that she feels a little bit guilty about going out tonight, as it's Madge and Harold's last night at home; she feels like she should have stayed in. Matt reminds her that Harold *told* her to go out. They head up the steps of No. 32 and Matt knocks on the door. There's no answer, though. He knocks again. MATT: I can't: I gave it to her so she could get one cut for herself. Matt knocks again and he calls out Melanie's name, but there's still no answer. GEMMA: Let's just go, eh? She's bound to be back by the time the concert finishes. MATT (sighs): But Gemma, you don't understand: the tickets are inside the house, OK? No Melanie, no tickets, no concert. Gemma suggests that maybe Paul kept Melanie back after work. Matt agrees that that's possible. 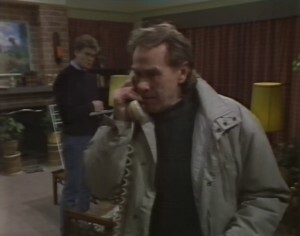 He tells Gemma that they should go and pick her up. ADAM: So is this the beautiful Isabella? CHRISTINA (wearily): Not you too. Adam asks Christina to introduce him to Isabella. Isabella is just finishing her call, and Christina introduces her to Adam, who proceeds to speak to her in Spanish! Isabella compliments him, but Christina looks at her with a wary expression on her face. 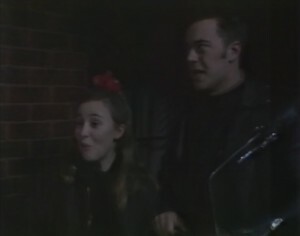 Paul is emerging from the office of the Robinson Corporation as Matt and Gemma rock up. Matt comments to Paul that Melanie clearly isn't there anymore. Paul replies that he let her go about 3:30, 4:00 so she could move into his place. Matt sighs heavily. MATT (to Gemma): You know, when I get ahold of her, she's going to get one big earful. Melanie is still sitting in the armchair, listening to loud music through the headphones. Paul arrives home and Isabella rushes up and gives him a warm hug. Paul hands her a bottle of wine. She tells him to sit down, as she's made a few tortillas for him. Paul asks her what she got up to today. CHRISTINA (coolly): You rang home. ISABELLA (pointedly): A very short call – as you asked, Christina. Paul asks her how her family is. Isabella tells him that George isn't well: she may have to go home if he doesn't get better soon, as her brother's money feeds the family, and if he cannot work, *she* must. PAUL: Just hold it there, Isabella: you don't have to go. Now how much money would it cost to see the family through? PAUL: Just tell me how much, eh? ISABELLA (hesitantly): Four or five hundred Australian dollars. PAUL: Oh, that's nothing to worry about. I'll telegraph some money through tomorrow morning. ISABELLA: You cannot do that. PAUL: Isabella, I said I don't want you to go. Now don't start standing on pride, please. ISABELLA: Oh, I do not, for my family's sake – but please don't send the money by telegraph; please mail them cash: if the money goes through the bank, they will lose much on the exchange. Better to deal in cash on the black market. Christina looks at her suspiciously. EDDIE: You and Harold have been really good to me – straight up. Now it's my turn to do something for you, and I'm glad I can do it. Melanie has fallen asleep in the armchair, still with the headphones on and music playing loudly. She's oblivious to hammering on the door. Out on the step, Gemma points out to Matt that Melanie isn't there. MATT: But she *was* here: the lights are on. GEMMA: Well obviously she's gone out again. As Matt continues hammering, Gemma sighs that they can forget going to the concert now: it's going to start soon. Matt tells her that he'll break into the house. Gemma, however, suggests that he tries the windows first: one of them may be unlocked. MATT: You know, I paid fifty bucks for those tickets. I'm going to use them even if Melanie has to pay for the windows I break getting in. He walks round to a window and tries it, but it won't budge. He manages to find a tool in the garage to allow him to start using it as a jemmy. Inside, Melanie's tape comes to an end and she wakes up. She stands up to begin her unpacking, but suddenly hears a noise outside. She looks around, nervously. Outside, Matt isn't having any luck with breaking in. Doug is just about to head out when the ‘phone rings. He answers it. DOUG: Doug Willis... Why are you whispering, Melanie? I can hardly hear you... Someone's trying to get in? OK. First, turn off the lights. Listen: you know your way around the house; the intruder won't; you've got the advantage. Adam and I are on our way. Just hang in there. With that, he hangs up. He dashes out of the house with Adam right behind him. Matt is still trying to break in when the lights inside go out. GEMMA (looking surprised): Why would Melanie turn the lights out? MATT: She wouldn't. I reckon we've disturbed a burglar. Inside, Melanie is standing looking at the front window nervously. She looks around and picks up a vase. Matt finally manages to get the window open, but as he steps inside, Melanie screams and throws the vase at him. Melanie doesn't hear him, and she runs and flees out through the front door, into Doug and Adam's arms. MELANIE (panting): There's someone in there. There's someone in there. DOUG: It's all right – we're here. Matt comes out through the front door. MATT: We thought there was a burglar. MATT: Well, no. That was me. I was trying to get in. ADAM: Ever heard of using a key? GEMMA: No – Melanie's got it. MATT: We knocked and knocked and nobody answered. MELANIE (sheepishly): Oh, I didn't hear – I was asleep. MATT: Did you get that key cut? MELANIE: Yeah, yeah, it's on the hall table. Matt finds the front door closed, however. MATT (sighing): Melanie, would I be sorry if I asked where the original was? MELANIE (sheepishly): Right beside it. ADAM: Must have slammed shut when Matt came out. ADAM (bemused): Do things like this happen often in Ramsay Street? MATT: Only when Melanie's involved...! It's the next morning, and Harold is packing suitcases into the car, saying to Eddie as he does so that he wishes they'd been able to contact Joe: taking Sky away like this without his permission... Helen says she's sure Joe will understand why they're taking this trip. Harold helps Sky into the car. 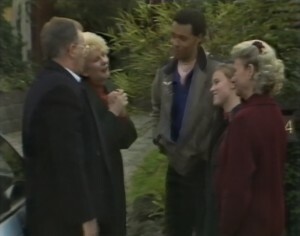 Madge tells Eddie and Gemma that there's plenty of food in the house. Everyone says their goodbyes. Harold reverses the car out into the street and he and Madge drive off. GEMMA: OK – now let's *party*!! GEMMA: I'm only joking, Mrs. Daniels! Paul is standing with Isabella in the reception area. He hands her some cash and tells her that, if she needs any more, she should just ask. ISABELLA: Thank you, Paul – you are very generous. PAUL: To be honest with you, it's guilt money because I can't spend the time with you. With that, he tells Isabella that he'll see her at lunchtime, and he heads into the office. Isabella turns to Melanie, who's standing behind the reception desk, and asks where she can catch a bus. Melanie tells her that it's just around the corner. MELANIE: Well if you want souvenirs, why don't you go and see Chrissie? She's got some great stuff in the gift shop, and I'm sure she'll give you a discount. ISABELLA: Yes, I am sure, but I'd rather buy practical things: clothes for my brothers and sisters... they do not have much. CHRISTINA: I *knew* she couldn't be trusted. MELANIE: What are you on about? CHRISTINA: Isabella. She gave Paul this big song and dance about her brother being sick and how the family needs money, so he draws out hundreds of dollars to send them, and she goes off on a *shopping spree*. CHRISTINA: She's conned you too, huh? Why am I the only one who can see through this ‘sweetness and light' act? MELANIE: I don't think it's an act. CHRISTINA: You're on *her* side? I thought you were my friend. MELANIE: I *am* your friend – but you've got it all wrong about Isabella: that money went first thing this morning on special delivery. I took it to the Post Office myself. What he's just given her now, he gave her to spend some money on herself – but she's not going to, no: she's going to use the money to spend it on her brothers and sisters because they need new clothes. MELANIE: Yeah. I know how you feel about Paul, and it must be really difficult seeing him and Isabella together, but she really is a very nice person. MELANIE: She is. Don't let your jealously cloud your judgement. 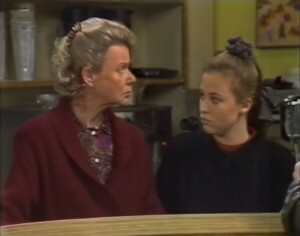 Eddie is behind the counter with Helen. Gemma is clearing tables. The ‘phone rings suddenly and Gemma goes and answers it. A few seconds later she tells Eddie that it's for him: an overseas call. Eddie takes the handset from her. EDDIE: Hello? ... Mum? Are you OK? While Eddie talks on the ‘phone, Gemma asks Helen carefully if she's going to be round at No. 24 all the time. She adds that she'd like a chance to prove herself to Madge without someone breathing down her neck all the time. Helen smiles that she's sure that can be arranged. Eddie hangs up the ‘phone. He looks upset. HELEN: Eddie? Is something wrong? EDDIE (quickly): No, no. Everything's all right. I'll be in the kitchen if you want me, OK?